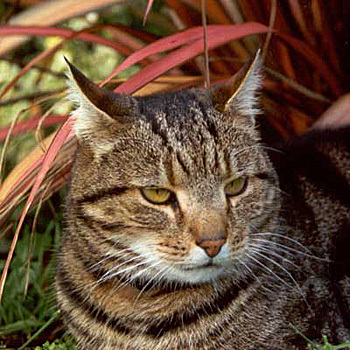 Big Fat Sifter is our biggest cat, a large brown tabby. He came to us medium sized. In fact he was lucky to come to us at all. Sifter had spent his earlier life "sifting" between two neighbouring student flats in town. Each flat though he was theirs, and each offered him shelter, companionship, and fed him. During breaks in tenancy he lived on his natural reserves, and when new tenants came in they accepted him as the flat cat, whichever flat they were living in. The cat's luck ran out in the December of 1997 when a departing tenant discovered that he really didn't belong to anyone, and righteously took him off to the local S.P.C.A. We had heard of this legendary opportunist cat and luckily managed to track him down, rescuing him just days before his execution (unwanted adult cats often ended up on cat death-row). A positive identification was made by one of his ex-owners, and I sat him on my lap to explain that we wanted to take him home and offer him a new life in the country. He smooched my hand twice and then bit my arm. I paid my money, stuffed him into a cat box, and took him home. Sifter, as he was called then, was quite a thin cat, but soon settled in, catching rodents and vigorously eating any food provided. He immediately adapted to the dog, and continued his two smooches and a bite routine with anyone who bravely tried to pick him up. Gradually those memories of foodless weeks faded in his cat memory, and Sifter's girth expanded. He became affectionately known as "Big Fat Sifter", and was often described by family members as "The Stomach on Legs". Big Fat Sifter is shameless in his desire for food. He will raid and devour food left over from every type of human meal, from vegetarian lasagnes to sweet and sour dishes. He has passions for chocolate, french fries and muffins. The cat will eat anything. Big Fat Sifter is a shameless poser of a cat, and he really turns it on for the camera. He'll lift his chin (is this my best side?) and fix his inscrutable gaze on the pet-paparazzi, then roll onto the ground and display his beautiful spotty tabby tummy. In all things he's arrogant but loveable. But his arrogance and lust for food has deeply affected his performance in the yearly Most Valuable Cat competition, run over the summer holiday weeks. His results for the last two years have been particularly disappointing. In order for him to register any points in the 2000 - 2001 season the organiser had to fill the pockets of her gardening shirt with dried cat-food. 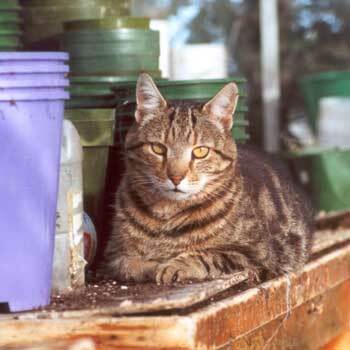 Sifter Cat often hangs out in the hay barn, and arrives at the house for the evening meal smelling of hay. The rodent population has declined noticeably since he came to live with us. He is also strong enough to catch rabbits, sometimes quite large ones. I don't enjoy his killing instincts but I know from experience how destructive rabbits can be here. There is a favourite spot on the patio (behind the Christmas tree in its pot) which Taj-dog has to check out every day, just in case any prey is still stashed there. And there often is - or at least there are smells which certainly drive the dog wild. 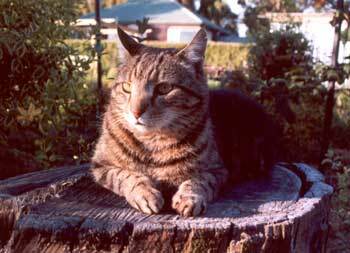 As a footnote to the above, I regret to tell you that Sifter the cat went AWOL in the late winter of 2002. Never to be seen again, we thought. Wrong! Fourteen months later he appeared, fat, shiny-coated, but rather feral in attitude. We fed him, he growled and ate, then disappeared out the door. Since this one reappearance I go walking down to the hay barn calling him at nights - no luck! He's "sifted" off again! Extraordinary cat!